Tankless water heaters are the newest, hottest item in heating the water in your home. Here’s what you need to know about them. They only heat water when you need it, so water is not standing in a 30 – 50 gallon tank needing to be heated at about 120 F degrees continuously. You never run out of hot water. They are energy efficient. Traditional tank water heaters run at about 65% efficiency at best. Tankless water heaters run at about 95% efficiency saving you money on your electric and gas bill. Because the water is heated as it is drawn to your faucet or tap, you never run out of hot water. With a traditional hot water heater, if the family returns from the beach, and 4 or more of you need showers and you need to wash the towels, the last few bathers are probably going to have to wait for the tank to fill and reheat or take a cold shower. Tankless water heaters save space. 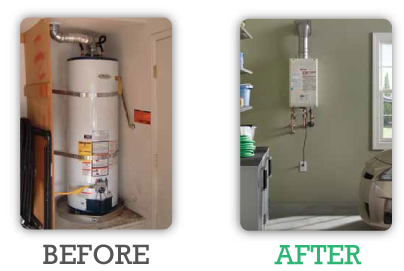 As you can see in the before and after picture, the hot water tank takes up about 36 square inches of space from floor to ceiling. The tankless water heater hangs on a wall inside or outside your home and is about the size of a small carry-on piece of luggage. Tankless can also be placed in small spaces under a cabinet or over a washing machine in RV homes where space is tight. Finally, the chances of having water damage with a tankless water heater are minimal. If you have valuables and heirlooms in your home that are in danger from water damage, tankless might be better for you. Expensive rugs, antique furniture, special floors, etc. all need to be protected. If your water heater is in the attic, ceiling damage and multi-floor damage is a risk. If you have a tradition water heater, make sure you check it yourself or have a regular maintenance call scheduled to keep it running at top capacity. The main reason people do not switch to tankless water heaters is the initial investment. If you don’t already have gas somewhere in your home, you will need a gas line installed. You might also need to upgrade your electrical panel. While these are investments, they also increase the value of your home and make it more favorable to buyers. If you have to move your regular hot water heater or are switching from an electric stove to gas and are going to have to run new lines anyway, this is a good time to switch to tankless because you are having to put the money out either way. Also, if many people where you live are upgrading to tankless water heaters, you might want to upgrade to keep your property value higher as buyers compare items like this. Like any water heater, tankless water heaters need to be maintained to maximize their lifespan. 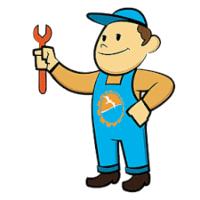 Ask us about your manufacturer’s annual maintenance and flushing recommendations. Compare moving a hot water heater with installing a tankless. Tankless gives you peace of mind when you go away. No worries about standing water when you return. Tankless is more expensive than regular water heaters, so weigh the length of time you will live there and whether you believe it will increase the value of your home. You could get your investment back when you sell. 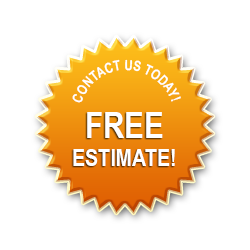 Call Suncoast Plumbing now for a free estimate and tips for how to get your tankless water heater cheaper.